That Golem that was just unveiled in one of the main squares of Pristina, the capital of Kosovo, turns out to be none other than William Jefferson Clinton. Apparently he is something of a god over there: The locals are grateful for his initiating, in 1999, the NATO bombing campaign against Yugoslavia that curbed Serbian aggressions against the ethnic Albanians, and so they have raised this astounding monument to the man. Eleven feet tall and fashioned from bronze, our 42nd president towers above one of the capital’s main thoroughfares (also named for him), holding a dossier in one hand while raising his other in something between a greeting and a salute. 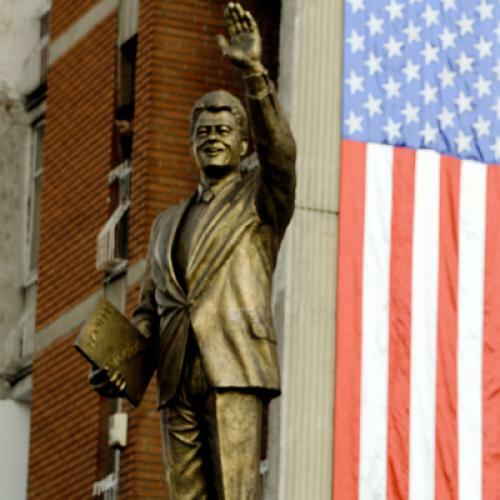 "I never expected that anywhere, someone would make such a big statue of me," Clinton, clearly abashed, announced to the crowd at the unveiling. His palpable unease was surely as much a question of aesthetics as a protestation of modesty. For the sculpture really is lousy. Though ultimately based on the ancient Prima Porta statue of Augustus Caesar, it can be more immediately traced back to those superhuman man-tractors representing the likes of Lenin, Brezhnev, and Ceauşescu that littered the Soviet Block in times gone by. Indeed, just as Augustus, Nero, or Marcus Aurelius might be depicted in the guise of Hercules or Apollo, or some minor local divinity, so Clinton is bodied forth here in a form that apparently resonates with the citizens of Pristina. He stands as the type of benign, yet forceful strong man that is well-known in these parts, a friend and protector of the people, who, by virtue of being bigger than they are, can also see further into the future and will take them there. The ham-fisted realism of Clinton’s tie, his creased trousers, and his buttoned jacket definitively clarify—for anyone who needed clarification—why such forms of monumental art, entirely forthright and without irony, are no longer being made today, at least not in the First World. From antiquity through the aftermath of WWI, we knew how to make commemorative statues. But more recently our culture has become so incapable of monumentality, and so saturated with irony, that even as we feel more inclined to commemorate events than ever before, we have lost all instinct for how to do it: Witness the unending controversies surrounding any monument to 9/11. The one thing that redeems the new Clinton monument, in human if not aesthetic terms, is that it’s very maladroitness is an incontestable warrant of its sincerity.